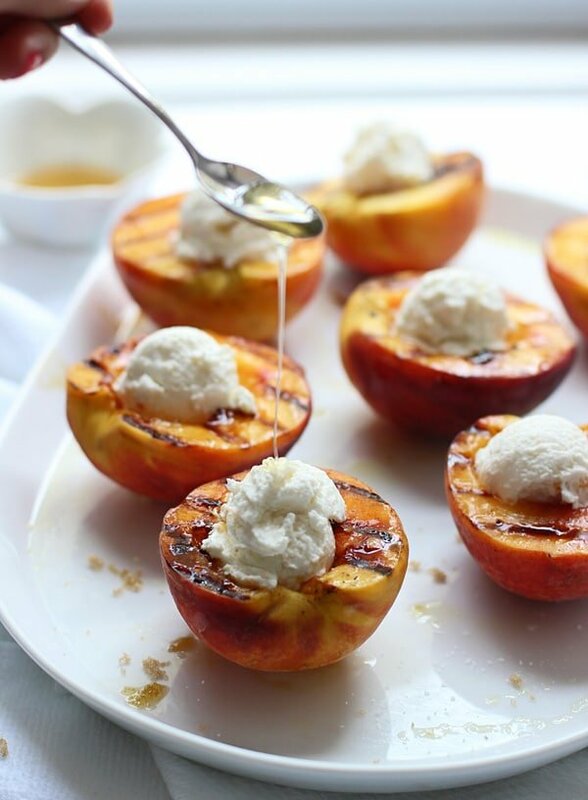 For some odd reason, anytime I picture myself eating peaches, I’m always barefoot in the midst of a scorching hot August day, taking a bite ever-so-carefully to avoid that juice down the face, juice down the arm drip that perfectly ripe peaches tend to do. It doesn’t usually happen that way, but one or two times per summer, I’m pleasantly surprised when the juiciest of juicy peaches finds their way into my kitchen. These few and far between kind of peaches don’t need to be thrown into a pie, they don’t need copious amounts of butter or sugar to enhance their natural sweetness, and they definitely don’t require you to nearly break off a tooth by merely taking a bite. When I saw my first obscenely large display of cheap peaches last weekend, my on-a-mission, stop-for-nothing mantra switched gears. I stopped, and was hopeful that these peaches, were the peaches that would require me to flip off my shoes and brace for the drip. These were not those peaches. Goshdarnit! 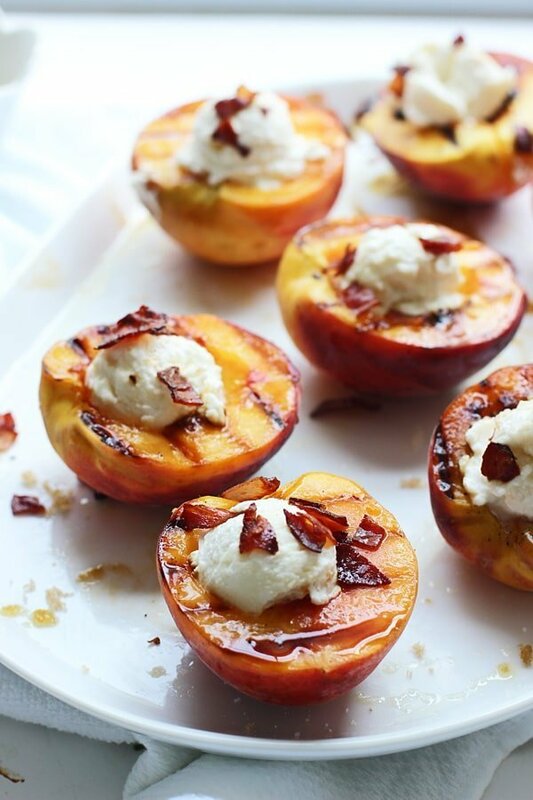 Instead of sulking and cursing myself for buying pounds of inedible fruit, I decided to make the best of it, and what better way to make the best of it, than grill ‘em up and serve them with loads of creamy ricotta, sweet honey and salty crispy prosciutto? If you can believe it, this was my first time to actually fully pit a peach, usually I just bite right in or cut the cheeks off because I’m eternally lazy when it comes to preparing foods as they should be. I even had to Google how to do it, because when I first tried, I completely butchered the poor guy, apparently the trick is to cut down the indented line and twist like an avocado. Worked like a charm. After I successfully wrestled the pits out of the flesh, I doused them with fruity olive oil, a liberal sprinkling of salt and then covered them in brown sugar. I let them sit for just a few minutes, until the sugar basically turned to liquid and then grilled them until they had distinct grill marks. The heat from the grill combined with the brown sugar transform the previously rock hard flesh to a soft, seriously juicy state. Dessert doesn’t get any simpler and summery than that. 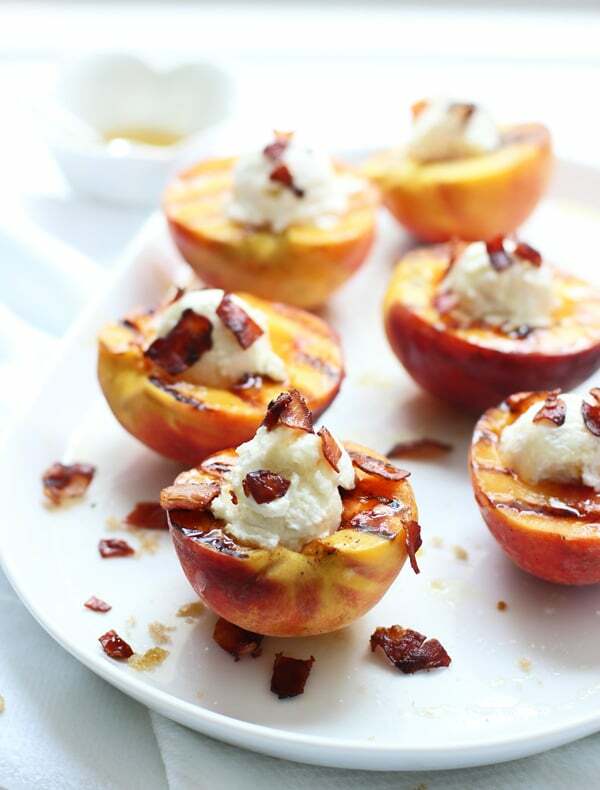 Brown sugar grilled peaches are stuffed with creamy ricotta, drizzled with honey and sprinkled with salty, crispy prosciutto for an easy summer dessert that will blow guests away. Heat a small non-stick sauté pan to a medium heat. Add chopped prosciutto, cook until crispy, stirring occasionally, about five minutes. Set aside. Heat a grill or grill pan to a high heat. 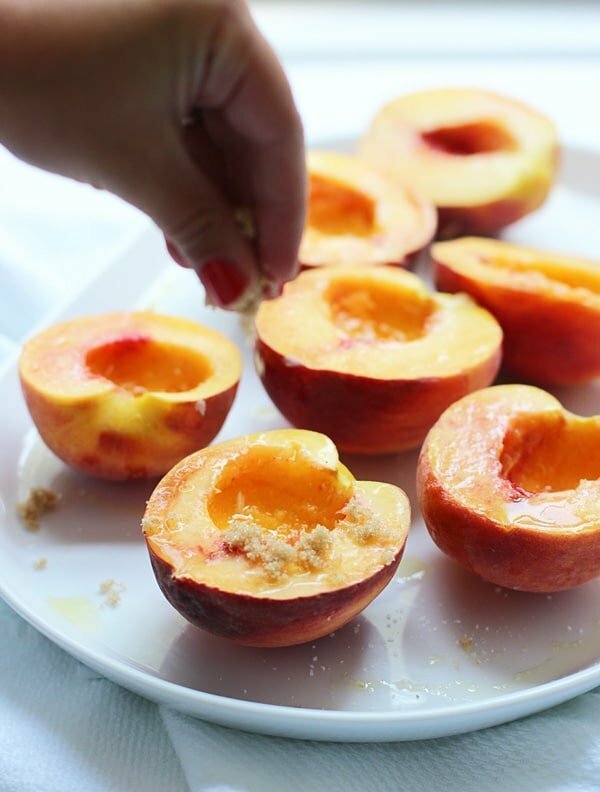 Brush peaches with olive oil. Season with plenty of salt and pepper and then sprinkle with brown sugar. Grill peaches until they have distinct grill marks, about 1-2 minutes. Remove and spoon ricotta where pit indentation was. Drizzle with honey and sprinkle with prosciutto. 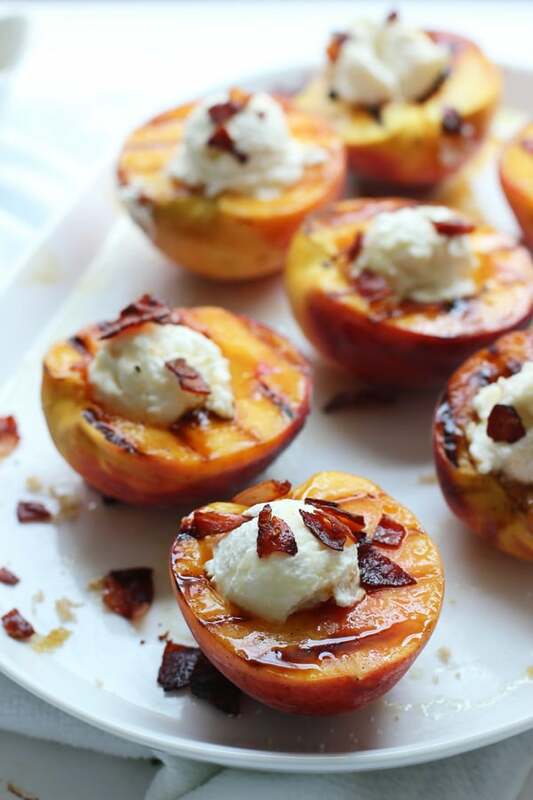 20 Responses to "Brown Sugar Grilled Peaches with Ricotta, Honey and Crispy Prosciutto"
Nicole, my mouth is watering! Don’t you hate the less-than-perfect peaches that exist out there? I mean, the perfect peach can be kind of difficult to find but if we need to settle for eating them this way, then I’m good with that 🙂 I have a similar post coming soon which is great news because I want to inhale these! And there are soooo many of them!! Can’t wait to see your post!! Thanks Bri! UM WHAT! 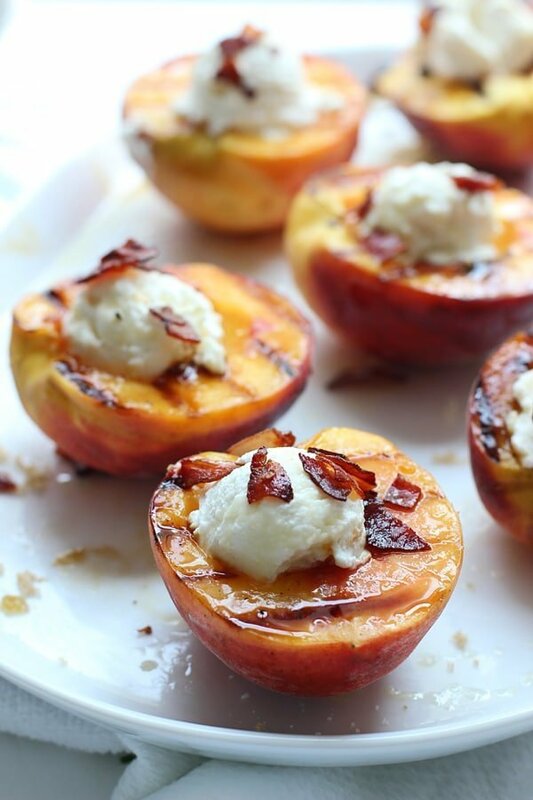 Peaches and prosciutto and cheese? Sweet, salty and creamy?! I want to marry these. Hahaha me too!!! Thank girly! Yes she does!! Thanks Isadora! These are beautiful. What a gorgeous way to enjoy one of summer’s sweetest fruits. Thank you for sharing such an elegant yet attainable recipe. Awwww thanks Monet! So sweet! Thank you Chris!!!! I’m glad I’m not the only one! Totally agreed – it doesn’t get any more summery than this recipe. I’ve been seeing grilled peaches everywhere lately and have got to get on the train. Your recipe totally takes the cake with ricotta and prosciutto though. I need these in my life!! You do!! There’s nothing like them! Thanks Kathi!! I eat peaches above the sink so that I don’t get any juice on me. :))) Having said that, I don’t care who is watching, I’d eat all of yours in a short minute! They are beautiful!! I like your style!! Thanks Kate!! I saw these on foodgawker and had to click over because the pictures were just so yummy! Can’t wait to try these. Gorgeous photos! It’s so hard to find good peaches!! I’ve only had maybe one or two so far this summer! This looks AMAZING. Sweet and salty goodness! Have an awesome weekend!! I’ve just made something similar with figs! So good! Your photographs are gorgeous as always Nicole!